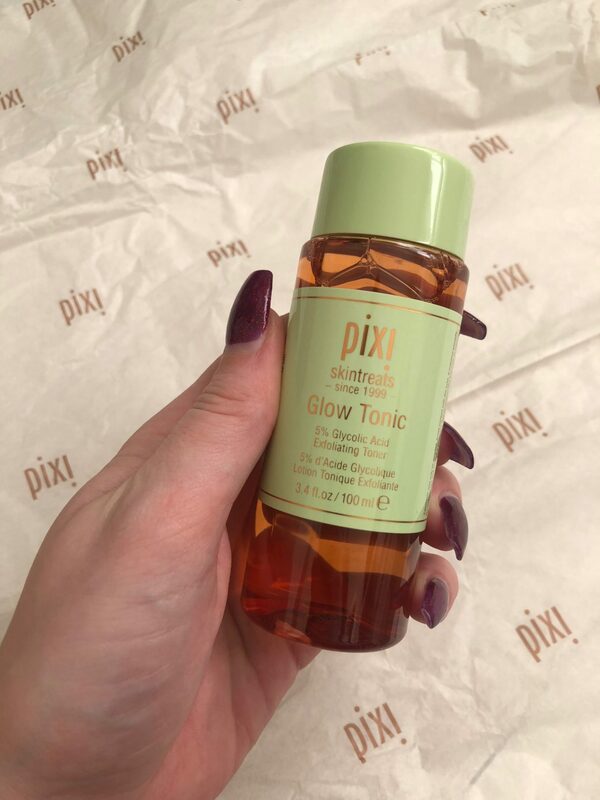 I’d say most people have tried Pixi’s coveted Glow Tonic in the past but if not they’ve definitely heard about it as it’s had a spot on the hall of beauty fame for as long as I can remember. 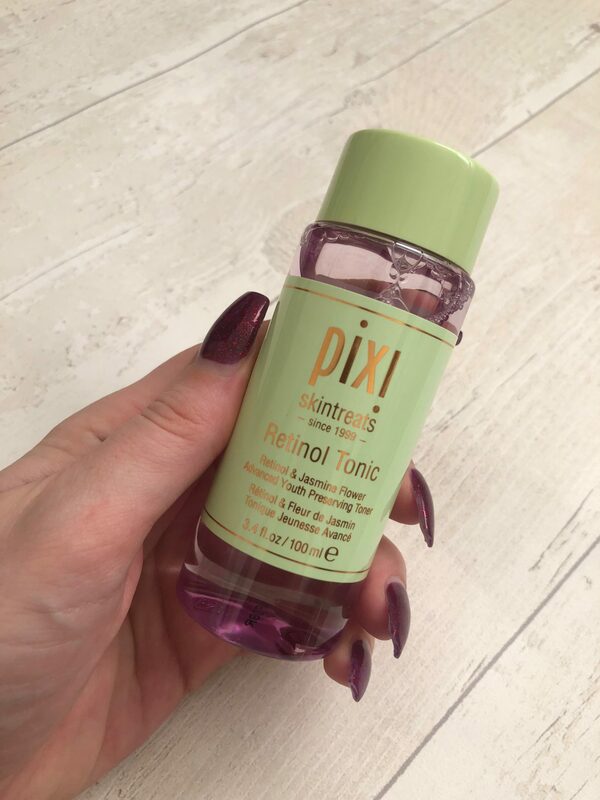 This is a toner containing five per cent glycolic acid which to non-scientific folk like us, means it works its magic to remove dead skin cells which is a factor for how popular it has been for quite some time. Other qualities of this toner is that it helps to treat dull looking skin to reveal a healthy-looking complexion with minimised pores. During week one, I applied this morning and evening by soaking a cotton wool pad as my skin in combination and needs a little TLC. If you have more sensitive skin, then you can use just once a day if you prefer. I found it lived up to its claims and I noticed on my pore-prone areas that my skin genuinely looked more refreshed and pores did look smaller. I have saved the rest to take into hospital with me when I have my baby as it was so refreshing and I enjoyed every time I used it. I’m sure I’ll repurchase the bigger sized bottle in the future, but for now, the travel size is a perfect addition and a great way to try out the famous product if you haven’t done so yet. During week two I tried out the sister of the fan-favourite Glow Tonic; the Rose Tonic. I’m sure this is a new-ish release from Pixi but I was excited to give it a go. As the name suggests, this little mini contains a wealth of rose water which is beneficial to the skin in many ways including its moisturizing benefits as well as rejuvenating qualities for easy-aggravated complexions. Other natural ingredients to help the skin includes elderflower (which helps to brighten and resurface the skin), aloe vera (which can soothe breakouts or problem areas) and chamomile (which helps to moisturise dry patches and reduce redness). I’d say compared to Glow Tonic, this guy is made specifically for those with dry and sensitive skin as you could see almost instant results on drier areas and definitely helps to calm redness and blotchiness in one swipe. If, like me, you have combination skin then you could multi-tone and focus this on dry areas and use the glow tonic on the more oily areas of the face. 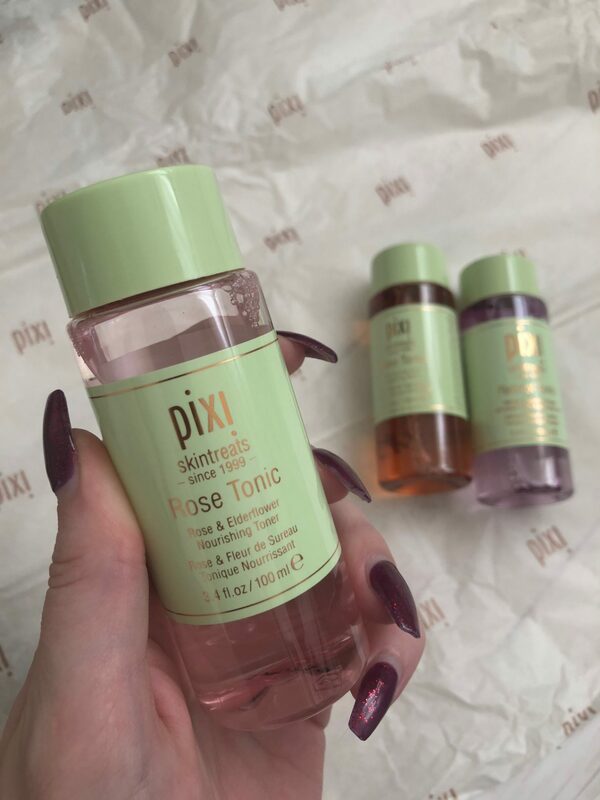 And finally, say hello to the newest addition to this Pixi tonic family. I believe this launched summer of this year and claims to be a youth preserving tonic that features unique time-release Retinol to help rejuvenate and moisturize the skin for a natural glow. Like the previous two products, this has a mix of powerful antioxidants and botanicals to replenish the skin for a smoother, softer appearance whilst soothing even sensitive skin. The first thing I noticed with this mini is that unlike the Rose Tonic, which as you may have guessed, smelt very floral, this had more of a herb/earthy smell to it which quickly disappeared after application. I’d say this is definitely the tonic to go for from the range if you have more mature skin or are beginning to see the effects of ageing. Being in my (almost) mid-twenties, I ensure I have age preventing products in my skincare routine and this was a refreshing way to add that in. Unlike the other two, I didn’t see instant results but during my week of using this daily, my skin remained bright and healthy and I didn’t suffer from any breakouts which is good as retinol can sometimes be a drying compound. Safe to say, I have loved using these trio of toners. I think it’s easy to disregard toners in your skincare routine but these really do make such a difference if you’re suffering from problem skin from sensitivity to acne. My favourite of the three would have to be the Glow Tonic (are you surprised?) but it’s great to see the new additions to help with all different skin types if the Glow Tonic wasn’t ‘the one’ for you. These mini’s are only £10 each and are available on the Pixi website. *these products were sent to me in exchange for an honest review, all opinions are my own, see my full disclaimer for more information.